American chemist Donald J. Cram won the Nobel Prize for Chemistry in 1987, sharing the highest honor in science with Jean-Marie Lehn and Charles J. Pedersen, for work that effectively created a new scientific field called host-guest chemistry. 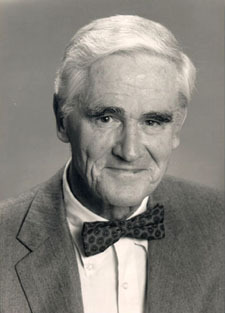 He spent the early years of his career researching artificial enzymes, and had an immediate epiphany after reading Pedersen's 1963 paper reporting the discovery of the first crown ethers (macrocyclic compounds containing repeat units of -CH2CH2O-, or any similar compound containing nitrogen, sulphur, phosphorus or silicon atoms instead of or in addition to oxygen atoms), so called because they physically resemble crowns. He spent the next two days constructing physical models of molecules, to determine which "host" structure would be most accommodating to "guest" molecules for bonding. Adapting Pedersen's findings to the theoretical synthesis of three-dimensional molecules that mimic the functioning of natural molecules, he developed this into a new methodology, host-guest chemistry, for synthesizing molecules that mimic certain chemical reactions of life. He taught at UCLA for almost five decades, where he traditionally celebrated the last day of school by performing folk songs on his guitar in class. He was also a skilled surfer. In a famous mix-up, when Cram won his Nobel Prize a representative of the Royal Swedish Academy of Sciences mistakenly telephoned and congratulated a California carpet cleaner also named Donald Cram, who became a minor celebrity for several days.